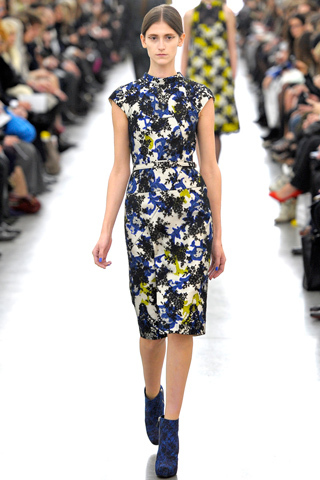 This is a bee-yoo-ti-ful dress from Erdem’s fall 2012 collection. Elegant yet modern, with a print that’s bold, and yet doesn’t wear the woman. Here’s what we’re looking for in order to approximate this look: Knee length. Abstract print. High neckline. Cap sleeves. I spent a good long time pondering why this silhouette was so familiar, and yet couldn’t be found anywhere. There were precious few approximations, but they are nowhere near close. I found the cap sleeves, but not the high neckline, or a print, but not the knee length, etc. Then it hit me: The cheongsam. It’s a modified cheongsam dress sihouette. Whenever a designer is appropriating a classic style like this, it never hurts to go right to the country of origin and look for a modern updated version there. The trick is to then pair this still traditional dress with modern accessories (in this case, a belt and ankle boots) to get a look that’s runway, not costume shop.